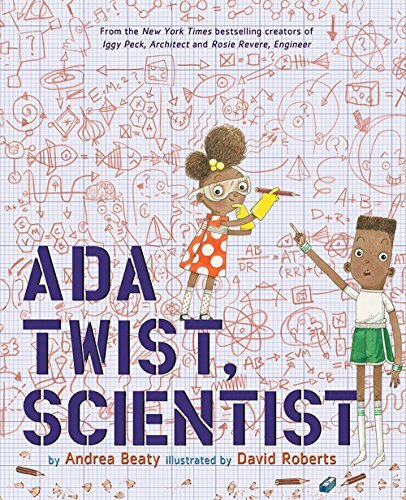 In author Andrea Beaty’s lively new rhyming picture book called Ada Twist, Scientist, young Ada Marie begins life as a quiet and unassuming baby who doesn’t talk until she turns three. However, Ada was named after two inspiring female scientists—Marie Curie, whose work led to the invention of the X-ray, and mathematician Ada Lovelace, acknowledged to be the very first documented computer programmer—and Ada soon lives up to those names and makes up for her years of silence by pelting her parents with a barrage of “who, what, and why” questions, including why a grandfather clock ticks and tocks and why it’s not called a granddaughter clock instead. As Ada grows older, her questions become more sophisticated: Why are there pointy things stuck to a rose? Why are there hairs up inside of your nose? Ada even ponders where in the world stinky smells come from, and she forms hypotheses, conducts tests, and tries out wild experiments (including spraying her family cat with perfume and fancy cologne) to get her answers. All the while, her “frazzled” parents try to curb her farfetched (and messy) experiments without squashing her curiosity and her love of answering questions about the unknown. Ada Twist, Scientist is adorable. Beaty’s rhyming text is delivered with delightful precision, and although the text may seem a bit long for younger audiences, it won’t fail to leave readers with a smile on their faces and a twinkle in their eyes. David Roberts’ illustrations are the icing on the cake that should transform this book into a classroom favorite. Ada’s fluffy afro puffs and her wide and intelligent eyes will have early elementary-aged children rooting for her even as they marvel at the astounding mess she leaves in her wake as she is conducting her experiments. Children of color, especially, will love reading about this smart, sassy and quite lovable little girl who looks just like them. Thanks, Mr. Roberts! Use this book to jumpstart conversations about scientists, girl scientists, gender roles, forming hypotheses, giftedness and childhood genius, and individual creativity. Or just use it for laughs on a lazy school day afternoon.